Pozza di Fassa is located in the middle of the Val di Fassa valley, between Moena and Canazei, surrounded by the beautiful Dolomiti Mountains, one of Unesco’s Heritage Sites. The position of Pozza di Fassa and the Val di Fassa Alpine Touring Hotel is perfect for mountain lovers. During winter, you can spend a fabulous winter holiday in Val di Fassa, skiing on the slopes of the Latemar, the Dolomiti Superski district and the mythical Sellaronda. In summer, the Val di Fassa valley, and Pozza di Fassa in particular, is the ideal location for those who enjoy walking in the woods or climbing the Dolomiti peaks. 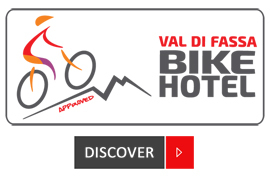 Let’s not forget that the Val di Fassa offers beautiful routes for mountain bike riding, road bike riding (often our streets are part of the Tour of Italy route), trekking and Nordic walking, via ferrata climbing and mountaineering, as well as a quiet location for those who want to relax away from the chaotic cities. The Val di Fassa Alpine Touring Hotel is a reference point for mountain lovers. The warm hospitality of Cynthia and Max, the excellent cuisine and the Relaxation Center will ensure that your holiday will be unforgettable. Starting on the winter season 2015/16, there will be an active connection to the Sellaronda ski carousel that will allow you to ski on all 4 Dolomiti passes: Passo Pordoi, Passo Campolongo, Passo Gardena and Passo Sella. The connection is active from the Buffaure Ski Area, just 5 minutes away from the Val di Fassa Alpine Touring Hotel.